This full scale banjo lets you tune and play it like a guitar, but it sounds like a banjo. 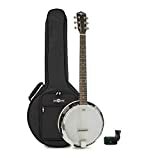 A fast way for anyone to start playing, you will be impressed by the quality and sound from this 6 string banjo. Beautiful wood grains on mahogany and the nickel plated arm rest are features usually found on much more expensive models. 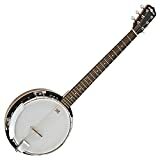 It has never been so affordable to own a quality six string banjo! This is a mahogany 6-string guitar banjo with resonator.